What Is The Create To Donate Ambassador Program? Thank you for your interest in the Create To Donate ambassador program. My name is Dana and I am the founder of Goods Giving Back – a philanthropic marketplace for makers who want to craft things they love to benefit nonprofits and for nonprofits to tap into their wonderful, crafty donor community as another fundraising channel. Why is Goods Giving Back different from other marketplaces? Well, this marketplace is not intended to be a maker’s fulltime shop – but instead, the opportunity to be philanthropic with their crafts and keep their “for profit” efforts separate from their charitable efforts. In addition, unlike the popular marketplaces, when an item sells in the Goods Giving Back marketplace everyone is paid at the time of sale via Paypal (i.e., immediately) when the item is purchased. The maker-designated nonprofit receives a minimum of 50% of the product price and the maker is reimbursed up to 35% for the cost of materials. So the maker doesn’t have to worry about keeping track of how much they should be donating to the named nonprofit in their shop intro and, even more importantly, the customer knows exactly where the money was paid and when. 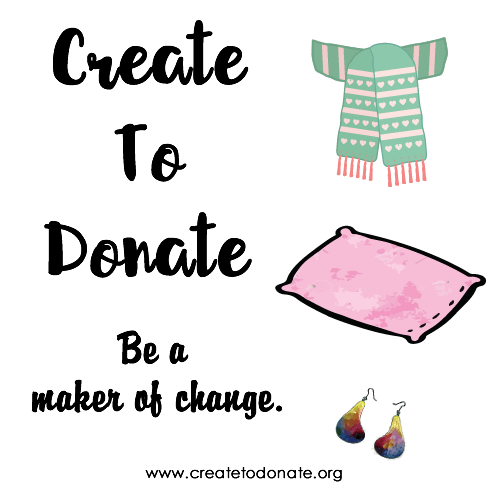 Why Are You Launching Create To Donate? Why Have Create To Donate Ambassadors? Like any good campaign, in order to reach the most people, I need to build some great interest and buzz. While I will be diligently promoting it through social media and pitching news media outlets, I will still need help to bring it to the next level and I believe having a community of crafty ambassadors is the just the answer. To keep it short and simple, the overall goal of the campaign is to provide people with both the information of the kinds of things they might create to donate and specific places where they can then donate their handmade goods. There will, of course, be other social good content sprinkled in there but those are the two main broad-based content buckets. Goods Giving Back and the Create To Donate ambassadors will ask people to make a pledge to create to donate two (2) items throughout the campaign and to let us know to whom the items will go. We will have badges/buttons available for all participants to showcase their participation. I want this to be a lot of fun for everyone who participates, but even more so for my Create To Donate ambassadors who are putting their time and energy into making the event a success. So, if there is something new you’ve always wanted to try (vlogging, Snapchat, Periscope, creating ebooks, a new way to create images, etc.) and having a collaboration buddy will help you get over the hump, let’s try it together! What Are The Create To Donate Ambassador Benefits? I appreciate and value your time therefore I am offering a whole host of benefits to people who qualify and commit to being a Create To Donate Ambassador. There are no requirements around blog traffic or social media follower count. If your blog’s primary focus is crafting or DIY and you’re reading this post, that means you’ve already been given the golden ticket to decide if this participating is right for you. Goods Giving Back will write a post to feature your blog/company on the Goods Giving Back blog (we can do this in any style you want – interview Q& A style, women’s glossy magazine storytelling, or <enter your preference here>). The option to have a guest post on the Goods Giving Back blog showcasing your crafty skills in the form of a tutorial or expert advice on how to select the best materials, tools, etc. This can be a repost of something from last year that you’d like to get back out there if writing original content would be tough at this time. A group Pinterest board (that will continue even after the official campaign). Promotion of your blog/company through all of Goods Giving Back social media channels (Facebook, Instagram, Pinterest, Stumbleupon). Instagram reposts on the dedicated Makers Gonna Donate Instagram feed throughout the campaign (still in development). Ready-to-use badges and buttons to add to your blog posts and sidebar letting people know you’re a Create To Donate ambassador. Please note: Additional options may be added as the event gets closer. What Are The Create To Donate Ambassador Requirements? Place the Create To Donate badge in a sidebar on your site so that it’s visible on every page throughout the campaign. Share one social media post per week on one social media platform of your choice tagging Goods Giving Back (when appropriate) and using the hashtag #createtodonate. If you have integrated two of your platforms (like having Instagram send your status to Twitter), then that’s even better! Subscribe to the Create To Donate Ambassador Newsletter throughout the campaign. To make it easy, I will be using a newsletter to communicate with everyone so that everyone receives the same info. This will also help remove the challenge of disjointed email threads. A subscription is therefore required so that you’re receiving all necessary information and updates. Follow or “Like” Goods Giving Back on all social media platforms – Twitter, Facebook, Pinterest, Instagram (both accounts), and Stumbleupon (only if you already use & stumble) so that you can easily share content when you are able. Pledge to donate one item to the nonprofit of your choice by 12/31/16. This can be donated to a local nonprofit of your choice or you may list an item for sale in the Goods Giving Back marketplace and select one of the existing beneficiaries. For US ambassadors, these items could be either physical or virtual goods. For international ambassadors, marketplace items may only be virtual items so we don’t have to be concerned about exorbitant shipping costs. Be kind with your words and your actions. Your blog and posts related to Create to Donate are, at their sauciest, PG-rated. You will not misrepresent Goods Giving Back or the Create To Donate campaign. Thank you for taking the time to learn more about the Create To Donate ambassador program. I hope that you’ll join me in making a difference in our communities through our crafty endeavors! If you have any questions, please feel free to contact me directly at info [at] goodsgivingback [dot] com. If you’re ready to join the team (and I hope you are!) please sign up to participate by subscribing to the Create To Donate Ambassador newsletter. I will start sending out information and details in July but will always be available to answer questions at the above email in the meantime.